We use to hear a statement, “Turntable is a device that converts grooves in LP’s into sound waves”, but this isn’t entirely true. In reality, it’s the phono cartridge performing this transformation, other components – platter, motor, stylus provide supporting job. So, when it comes to improving the sound quality of your turntable, first thing to consider is the phono-cartridge. Pick up vibrations from rumbling motor. You can think about all the other background noises that can affect the sound quality. Let’s dig deep and find out how you can improve the sound quality of your turntable without being to extravagant. Sound quality is affected by the manner of placement, as well as the furniture on which the turntable has been placed. Here are two observations and tips to overcome background noise issues. Take a look at the turntable’s placement, because it can affect the sound quality negatively. If the turntable is placed on a wobbly furniture, the sound quality will definitely got worse. Put the device on solid stand or shelf. You may have a shelf or cabinet that can be moved with a finger, you can try this trick: Use paperback books between the wall and the back of the furniture. In this way, you can eliminate the lateral movement to a large extent. Reducing or removing lateral movement of the furniture can improve turntable’s sound quite significantly. Modern-day turntables feature anti-vibrating components, to minimize sound distortion, but even then placement does have a role to play. Apart from the lateral movement, also check horizontal level of the turntable. Not to mention that the turntable lies parallel to the shelf’s surface, you can use a bubble level to make sure that it’s parallel to the floor. Slight inclination can affect the rotation of the platter and affect the sound quality. If your turntable doesn’t have adjustable feet, you can put coins under the feet. Dirt-factor has been one of the basic and direct cause of poor sound quality. The reason is, vinyl records, as well as the turntable mechanism can attract more dust than any other item in your living room. Construction of vinyl, its nature, and spaces in the grooves attract dust and dirt from the surroundings. As you switch on the turntable, the magnetic cartridge itself generates a magnetic field that can easily attract dirt and debris from the surrounding. If you have a direct-drive turntable, it’ll have added vibration reducing features to minimize vibrations of motor, but belt-driven turntables seldom have these features. In one way, belt-driven turntables are better for homes, because you can always improve the sound quality with simple cleaning of the belt. Take out the belt once in a while and wash it with warm water. Remove the debris using a soft towel and, when it gets dried, put it back. This will make a little difference in sound quality. Make a habit of cleaning the platter as many times as you play records. Same goes for the records. Dirt and dust on the platter can easily transfer to the vinyl and penetrate further inside as the stylus runs on to the surface. Inspect the stylus regularly with the help of magnifying glass. Make sure that the tip touching the surface of the record should be rounded, not chipped. Clean the stylus using hog paint brush and do not exert pressure. Replace the stylus from time to time. Same goes for the phono cartridge. Perhaps you know that the records should be properly cleaned before and after playing. You can remove dust and dirt using warm water and dish washing detergent (dilute solution). If you’re too considerate, you can use record cleaning kit and carbon fiber brush for better results. Make sure that the record dried up completely before you play it, as wet-playing can cause irreparable damage to the record. Now, listen to the record. There will be a noticeable difference in sound quality. This is a whole new thing and you have lots of option when it comes to amplification equipment and speakers. The more you pay, the better sound quality you will get. The sound you hear depends largely upon what accessories are connected with your turntable. Is there a receiver? Do you have an integrated amp? If you have a budget model without additional amplifier, you’d already got settled with that constant humming noise, but if you want to remove it, go for a quality phono pre-amp. 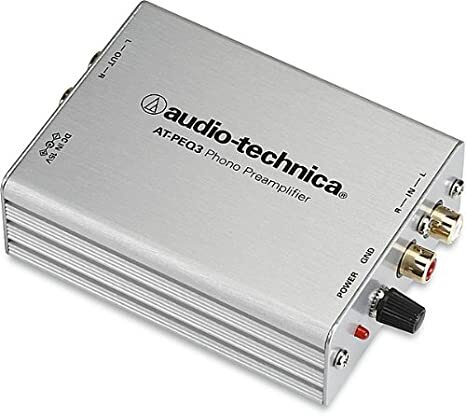 You can buy Audio-Technica AT-PEQ3 – Phono Preamplifier for the price range of $100 – $120. Plug the phono preamplifier into Aux or Video input available on the receiver or amp. Vinyl resurgence seems unstoppable right now, with more and more labels coming into the market from time to time. The present trend of vinyl record sales indicate it’s the best time to dive in and buy a turntable. If you’re one of those bargain hunters, there’s tons of vinyl music for you in yard sales, fairs and events, and local music shops. Don’t forget that e-commerce stores also offer deals and discount on vinyl records from time to time.